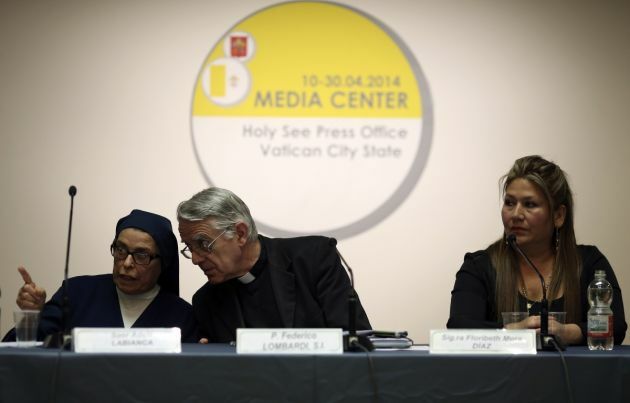 (Photo: REUTERS / Alessandro Bianchi)Sister Adele Labianca (L), witness of the miracle of the Sister Caterina Capitani by John XXIII, gestures as she chats with Father Federico Lombardi (C) as Costa Rican woman Floribeth Mora Diaz looks as they speak to the media at the Vatican April 24, 2014. Suffering a potentially fatal swelling in the brain, Costa Rican grandmother Floribeth Mora says a voice spoke to her through a photograph of the late Pope John Paul II, miraculously curing her and sealing the late pontiff's sainthood. Pope Francis in July 2013 had approved Mora's cure as the requisite second miracle for the sainthood of John Paul II, who led the Roman Catholic Church from 1978 to 2005. VATICAN CITY (Reuters) - Pope Francis on Sunday proclaimed the sainthood of two of his predecessors, John XXIII, who reigned from 1958 to 1963, and John Paul II, who was pontiff from 1978 to 2005. Here is a brief summary of how the Roman Catholic Church recognises sainthood. The process that can lead to sainthood, known as a "cause", cannot usually start until five years after a person's death. In some cases, this five-year waiting period can be waived by a pope if there is overwhelming evidence that the person under consideration lived a holy life. Pope John Paul waived the five-year period for Mother Teresa of Calcutta, who died in 1997, and Pope Benedict waived it for the sainthood cause of Pope John Paul, who died in 2005. In the early years of the Church, a saint could be declared such by acclamation by the people or by cardinals or by papal decree. Today, the Vatican department that studies sainthood causes is known as the Congregation for the Causes of Saints. Its origins date back to 1588 but the department has been modified several times over the years. After the Congregation accepts the name of a person to be considered for sainthood, that person is given the title "Servant of God". If initial investigations show that the candidate for sainthood lived what is known as a life of "heroic virtues" that person is given the title "Venerable". Historical and theological commissions in the Congregation study the person's life, read his or her writings and interview people who knew the person. At this point, in order for the procedure to continue, a miracle is needed. Miracles are not performed by prospective saints but by God. The Church believes that, because a prospective saint is in heaven, he or she can intercede with God to perform the miracle on someone on earth who has prayed to the prospective saint. A miracle is usually a medically inexplicable healing. A medical commission appointed by the Vatican determines if there was any medical explanation for the healing or not. Miracles are not necessary if a person was a martyr, someone killed in what the Church calls "hatred of the faith". If a miracle is determined for those who were not martyrs, the person can be "beatified" and is given the title "Blessed". John XXIII was beatified in 2000 and John Paul was beatified in 2011. A second, distinct miracle must take place after the beatification in order to proceed to sainthood. John Paul is credited with two miracles - the inexplicable healing of a French nun who was suffering from Parkinson's disease and the healing of a Costa Rican woman who was suffering from a brain aneurysm. Both had prayed to him after he died. John XXIII, on the other hand, is credited with only one miracle - the healing of an Italian nun who was stricken by a stomach disease doctors had determined would be fatal. In the case of Pope John XXIII, Pope Francis waived the requirement of a second miracle, ruling that after more than half a century since his death, there was no doubt that John was a holy man.